Amazon has been selling refurbished Kindles for almost as long as they've been selling new Kindles, but it looks like they might be planning to step it up. If you click on the screen shot you'll go to a page with 12 Kindle and Kindle Fire refurbs. That page appears to be unlisted, and it's missing all the accoutrement (like the side navigation bar on the left, ads, or suggested items on the right) found on the rest of Amazon's website. This leads me to wonder if this is simply an unofficial page which wasn't supposed to be shown to the public. The tablets and ereaders are priced at $10 to $30 off of retail. Given that we've seen the new models go on sale with those kind of discounts, I'm not sure that the prices for the refurbs are really all that great. But on the upside these refurbs come with the same standard 1 year warranty as new Kindles, so in effect these are new Kindles; they've just been opened already. TBH, this isn't entirely new. 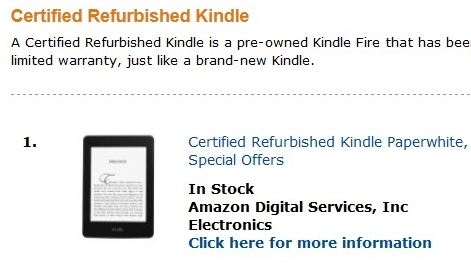 Amazon has always listed the refurbs; you just had to know were to look. For example, Amazon's Warehouse Deals dept has a section for Kindles. And if you knew to check the full listing for a Kindle model, you could sometimes find a refurb listed with the used and new units sold by third parties. The latest rumors suggest that Amazon is on schedule to launch several new Kindle Fires later this summer, though of course there's no new info on that story just yet.